Major League Soccer is coming back to Miami, with the face of the sport at the helm. David Beckham has chosen Miami for his MLS franchise, the retired soccer superstar announced at a press conference Wednesday morning. "We're very excited about this project," Beckham said. "Miami is a vibrant city, a city with a lot of passion and I know this city is ready for football, soccer, this time around, I know this is going to be successful." Major League Soccer is coming back to Miami, with the face of the sport at the helm. NBC 6's Christina Hernandez spoke with David Beckham about his plans to bring an MLS franchise to the Magic City. 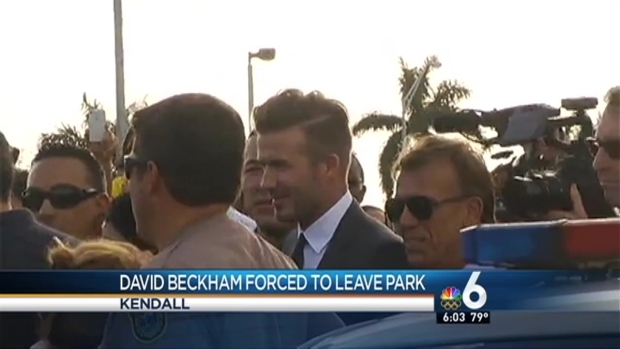 Beckham visited Kendall Soccer Park later in the day, where he was expected to meet with young soccer players. But the situation turned chaotic as a swarming crowd surrounding Beckham got out of hand. 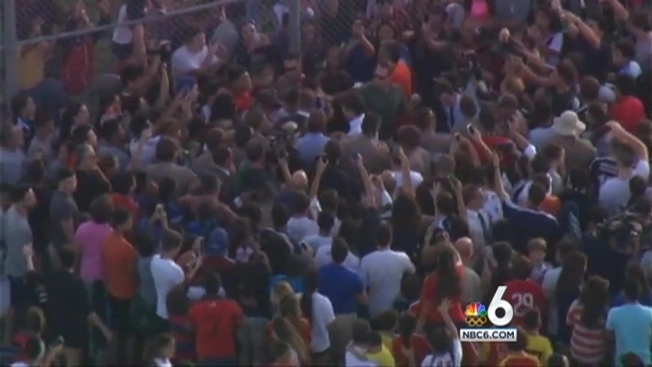 People could be seen shoving and pushing as Miami-Dade Police officers attempted to move the crowd back. Beckham was jostled as he was escorted back to a SUV and abruptly departed just before 4:45 p.m., leaving some fans disappointed. "It was more for the kids and unfortunately they didn't get to meet him," youth soccer coach John Rivera said. Beckham was escorted to his vehicle and taken away because crowd control was an issue, Miami-Dade Mayor Carlos Gimenez's office said. It was meant to be a small event for kids who play at Kendall Soccer Park, and the size of the crowd that turned out was not anticipated, the mayor's office said. Beckham said Wednesday that he thinks the new team will be different from the Miami Fusion, the MLS team that folded in 2001. He said he is "going to work hard for this city and I'm going to work hard for this league to make this team very successful." Although David Beckham was slated to meet with young soccer fans, his visit was cut short when he was swarmed by an unruly crowd. NBC 6'S Gilma Avalos reports. "For me, I wanted to create a team that we could start from scratch," Beckham said. "I know there was a team here 10 years ago and unfortunately they folded but I think going forward I wanted to create a team that can be very personal, everything that I've done throughout my career has been very personal to me." Beckham was joined by MLS Commissioner Don Garber and Gimenez for the press conference at Perez Art Museum Miami, where supporters cheered the announcement. "The world's most popular sport is coming to the world's hottest city," Gimenez said. "Here in Miami-Dade County, an international, global gateway community, we're the perfect home for soccer." David Beckham speaks with NBC 6's Chriustina Hernandez shortly after announcing his plans to bring an MLS franchise to Miami. "We have to get rolling on it, there is a time crunch to identify a site and get control of a site so that we can begin the process of construction of a stadium," Gimenez said. "We're gonna do all in our power to make sure that we get the stadium built in the right place and as quickly as possible so we can start enjoying the matches." Though nothing has been decided on, Beckham said he'd like a stadium in downtown Miami. "We want to build a stadium in Miami, the people of the city of Miami deserve a stadium that they're proud of, they deserve a stadium that's in a great location," Beckham said. "The mayor has promised us – I can say promised, I think – that we will be downtown." Beckham said no matter where the stadium is constructed, it won't be made with public funds. "We don't want public funding, we will fund the stadium ourselves, it's something that we have worked very hard to get to this stage where we can fund the stadium ourselves," Beckham said. "We want to create a stadium, we want to create a soccer team, a football club that is the people's football club." Beckham and his fellow investors were spotted in Mary Brickell Village Wednesday night. He posed in an Instagram picture with "American Idol" creator Simon Fuller and Miami billionaire Marcelo Claure. "He [Beckham] was extremely excited. We did a lot of thinking because we all know Miami's not an easy sports city,” Claure said of their project. In addition to bringing the top global talent to Miami, Beckham said he hopes to create a youth academy to find local talent. He also talked about trying to find the same success the Heat have found in Miami. "I've seen what happens to teams when you bring great players in, I'm talking about the Heat," Beckham said. "When you look at a team like that, when you look at a franchise like that, you want success, you want people talking about the team." Beckham said he has ideas for a team name but wouldn't say what they are. He also said the colors would be vibrant – a reflection of Miami. He had attended an invite-only reception at Miami's Adrienne Arsht Center Tuesday night.